The Annual Congress of the Scottish Philatelic Societies at Perth on 19-20 April 2013 will again have new items of interest to collectors. Post and Go Machines numbers 3 and 4 will be used for the first time in Scotland and Collectors Strips with a Congress overprint will be available from both machines. As before the ASPS has made arrangements for collectors to buy these direct to avoid the long trek to Perth. EDIT: Royal Mail have advised the organisers that both Machin and Flag stamps will be available. 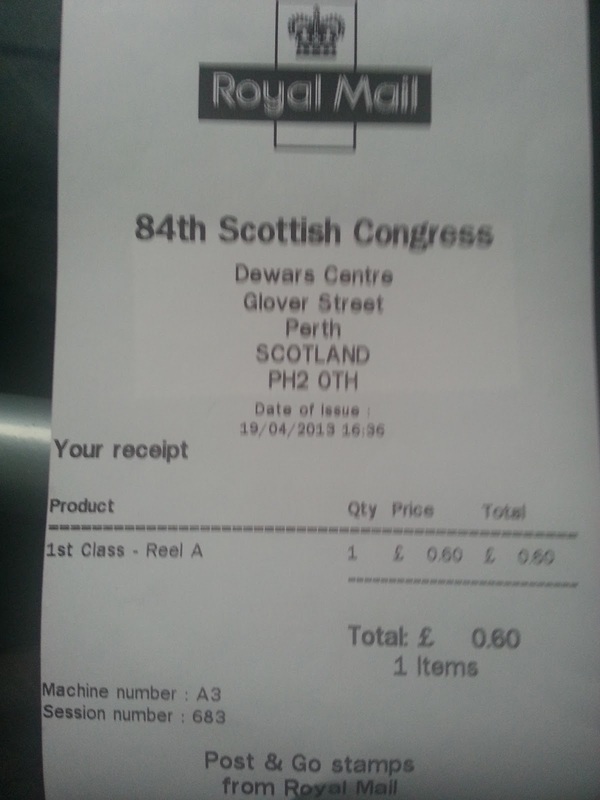 Collectors Strips will be available at cost (£6.42) plus postage and, if used, a PayPal surcharge as shown below. Also available are ‘Post and Go Smiler sheets that will have a unique Panda image alongside each stamp. The sheet will cost £10 plus postage etc as detailed below. Special Delivery if required £7.50 extra for £500 value; £10 extra for £2500 value. *Signed For covering a value to £500 - £15 extra. 4% must be added to the payment amount to cover PayPal deductions. Cover or postcard with one Post and Go stamp: £4 each inclusive of postage for up to 5 items. Cover or postcard with both Post and Go stamps: £6 each inclusive of postage for up to 5 items. Note: the covers and postcards are limited in number and orders are accepted on a first come basis. Special posting requests for all the above items will be costed and advised prior to sending the items. All readers requiring any of these items should order direct. We will have very few sets for local customers. Is it known what will be dispensed alongside the flags, I am presuming Machin. Subsequent to publishing this Colin has advised that both flag and Machin should be available - or so Royal Mail have said. They were both supposed to be available at Salisbury but I believe no Flags were supplied! Thank you; in that case I misunderstood something I was told or read. I was able to get flags on the Friday, and there are quite a few listings on ebay for flags with receipts for Friday and Saturday. Both Flags and Machin Post & Go stamps were avaiable at the Salisbury Stamp Show on Friday and Saturday. Informative site and wonderful images of beautiful stamps.